The snowfall New England saw Saturday was what we call an overachiever. We had talked about competition to see who could get more snow: Corpus Christi, Texas, Atlanta, Georgia, or Boston, Massachusetts? About six inches of snow fell in and around Boston giving us the edge by just an inch or two over our southern snow sister cities. Also a little above and beyond the call of the forecast is how far west and north the snow reached. Ski areas from the Berkshires, through southern Vermont, into north central New Hampshire, and even Sugarloaf Maine came in with five to eight inches of fresh powder snow. Along the coast south of Boston it was a heavy two- to four-inch snowfall. It was probably more of a challenge removing those three or four slushy inches than it was to remove the six to eight inchces further inland where the snow was colder and drier. The liquid equivalent of this precipitation was generally four to seven tenths of an inch. On Cape Cod, it was a half inch of rainfall, which is a bit of an underachiever in the rain forecast. 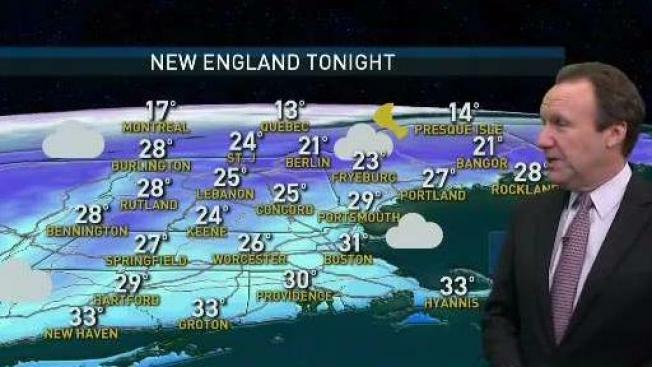 There is a weak front that's over New England Sunday night with a few snow flurries. Otherwise we are fairly quiet and seasonable through Monday afternoon. The low temperature Sunday night will be in the 20s to lower 30s with a few icy spots where we had some melting. Under a mixture of sun and clouds on Monday, temperatures will get well into the 30s. On Tuesday we're going to have a weak low pressure system moving out of New York, strengthening rapidly over New England during the day. It is an incredibly dynamic event, and we may have to call the play by play on Tuesday weather as it evolves. The early call is for most of us is to wake up to some snow on Tuesday, with a quick change to rain from Boston to Providence to New York City. But along and north of the Massachusetts Turnpike, we may see a burst of heavy snow, moving toward the north during the day. Areas along the south coast probably miss any new snowfall accumulation, but once we get to central and northern New England, it may be a double digit accumulation storm. And we can call it a storm. Unlike this last snowfall that fell gently with no wind, we are going to have rapidly increasing wind from the north late Tuesday and Tuesday night. This storm is fueled by really warm water south of us in the Atlantic Ocean and arctic cold coming into Ontario. Tuesday night and Wednesday that arctic cold will blast right to the coasts. Any slush and water will freeze very quickly making an icy and snowy start possible Wednesday. With a good amount of sunshine and scattered flurries on Wednesday, high temperatures only reach in the 10s north to 20s south, with wind gusting past 30 mph from the north. Thursday should be quiet, with less wind and plenty of sunshine. The high temperature will still only be in the teens and 20s. Another fast-moving system will race into New England from the Midwest on Friday, and it will probably deliver snow to anyone who has no snow on the ground after the Tuesday - Wednesday event. The outlook for our weekend is that it MAY be quiet, with more seasonable temperatures back to the 30s to near 40 degrees.